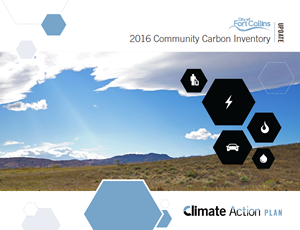 The City of Fort Collins is excited to share its 2017 Climate Action Plan (CAP) Update and 2017 Energy Policy Annual Update reports! The CAP report shows how the community is making progress toward its first climate action milestone – 20% reduction below 2005 levels by 2020 – and highlights some of the key successes of 2017. The Energy Policy Annual Update report shows community progress on energy-related goals, including increased wind and solar electricity generation, and increasing efficiency. More information on community progress can be found on the CAP dashboard and Utilities What We Do page. The City of Fort Collins, as an organization, has reached the 2020 climate target three years ahead of schedule. The municipal government has achieved a 21% reduction in carbon emissions while adding square footage, vehicles and staff. The reductions are a result of improvements by employees and departments to provide outstanding services, including reliable energy, transit, and water services, while also lowering our impact. We are now more than halfway towards achieving our 2020 CAP goal and are excited to share this progress in the 2016 Community Carbon Inventory Report. Overall, we have achieved a 12% reduction in carbon emissions while our population and economy have continued to grow. Read 2016 stories and highlights about how our community’s progress is part of the solution. 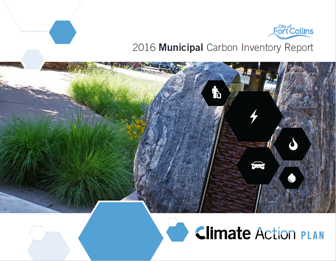 Our municipal government has achieved a 12% reduction in carbon emissions while adding square footage and staff. 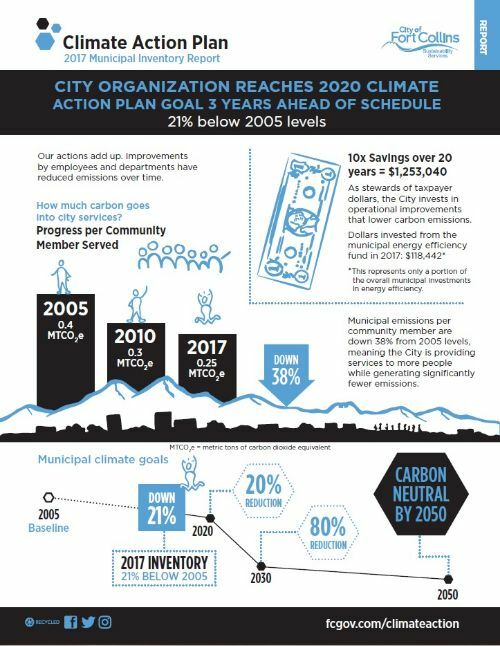 The 2015 Climate Action Plan Framework details the City of Fort Collins strategies to achieving our 2020, 2030, and 2050 Climate Action Plan goals.